How does a person’s way of thinking influence their personality, their values and their choice of career? 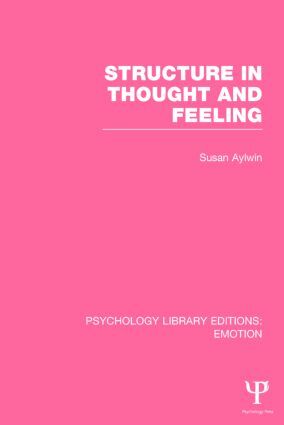 In this important study, originally published in 1985, Susan Aylwin uses such questions as a starting point for elucidating the relationship between thought and feeling. Three modes of thought are compared in detail: inner speech, visual imagery and enactive imagery – the last being an important addition to our understanding of mental representations. The structural characteristics of all three types are analysed using an association technique. Their affective aspects are then explored through a variety of means, including the analysis of daydreams, an examination of the evaluative complements of categorizing, the study of cognitive style, an exploration of such social feelings as embarrassment, and the experiential study of strong emotion. The author ends by integrating her findings, showing how thought and feeling are related aspects of the temporal organization of consciousness. Structure in Thought and Feeling is written in a lively and accessible style, and brings a refreshing perspective to many issues of central concern to psychologists interested in cognition, emotion, personality and psychotherapy. List of Figures. List of Tables. Acknowledgements. Part 1: The Three Forms of Representation 1. Introduction 2. Preliminary Sketches of the Three Modes of Thought 3. Free Associative Structures 4. Day-dreams, Fantasies and Other Idle Thoughts 5. A Cognitive Interlude: Individual Differences in Modes of Thought 6. Aspects of Identity Part 2: Particular Evaluative Issues 7. Values in Inner Speech: Preference for Categorical Clarity 8. Visualizing, the Environment and the Sentiments of Self 9. Emotions and Enactive Representation Part 3: Integrations 10. Mind and Time 11. The Psychology of Science. Appendices. Notes. References. Index of Names. Index of Subjects.